Winter has reached Louisiana at last! The mornings are nice and frosty and our windows have started sweating again. So where did all of the “indoor rain” come from? In a word – dewpoint. Their are 2 elements to dewpoint - indoor relative humidity and cold window panes. In this blog, I’ll discuss the second element –cold window panes and frames and ways to “warm” them up. Windows today come in a huge array of shapes and sizes, but the main components – the glass and frame – are still fairly straightforward. Heat conductivity in windows is measured as a U-value from 1.0 to 0 - the lower the U-value, the better the window. Normally this value includes both the glass and the frame as a unit but for our purposes we will consider them separately. Window glass is either single- or double-paned (triple-paned is available but not as common in our area). Single paned glass is the poorest insulator with a u-value very close to 1.0. Depending on the age and style of your house, you probably have at least some areas of single-paned glass. The transom and “side lights” surrounding many front doors are a good example. Double-paned windows have lower (better) u-values for two reasons – the layer of air sealed between the panes acts as an insulator and the spacers that hold the pieces of glass apart are made of materials that are poor heat conductors. These spacers slow down the transfer of heat from indoor pane to outdoor pane, thus keeping the inside pane warmer. First of all, check your window seals, particularly on the windows that sweat the most. Cold, outdoor air seeping around the frame will lower the temperature of the window dramatically, no matter what kind of frame you have. Make sure the exterior of the frame is well-sealed with caulking, the weatherstripping is in good condition and the frame latches securely. Secondly, try to raise the temperature of the window by partially opening the blinds and curtains that cover the coldest, sweatiest windows. Yes, uncovering a cold window will mean some energy loss from your home, however, it may just save your sills from rotting and mold growing. 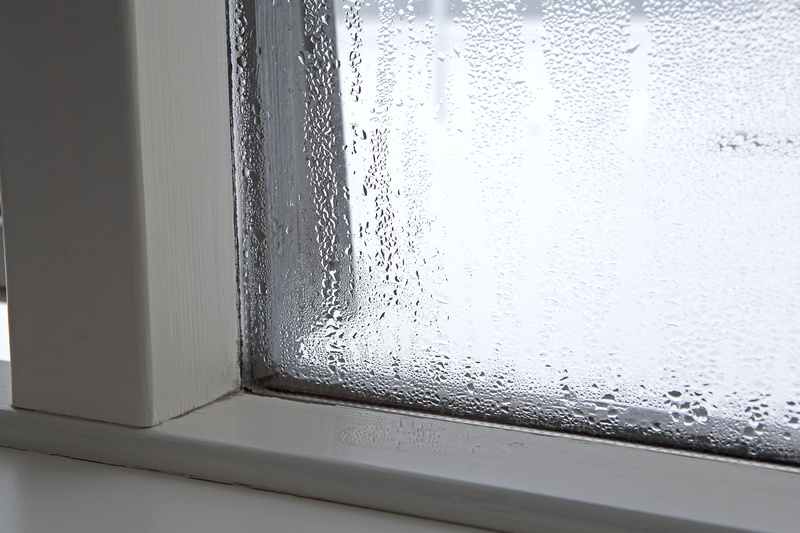 Try different levels of coverage until you find the point where condensation reaches a reasonable level. Taking this approach allows interior air to warm the window and frame. In homes with floor-to-ceiling drapes, it also eliminates the micro-climate that actually encourages condensation. In those situations, air trapped behind long curtains continuously rises and falls as it is alternately warmed (by the heating system) and cooled (by the window). If all else fails, consider adding Magnatite panes to the inside of the windows – particularly large expanses of single-paned glass - to increase the frame temperature, decrease infiltration and improve the overall insulation value.